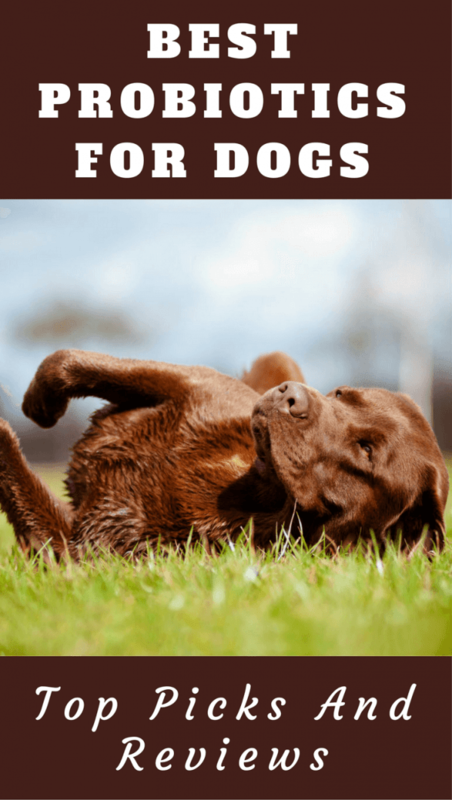 Many of us are very used to seeing adverts telling us that humans need yoghurts containing probiotics to help keep our stomachs healthy, but have you ever stopped to consider dogs may also need the same kind of supplement? 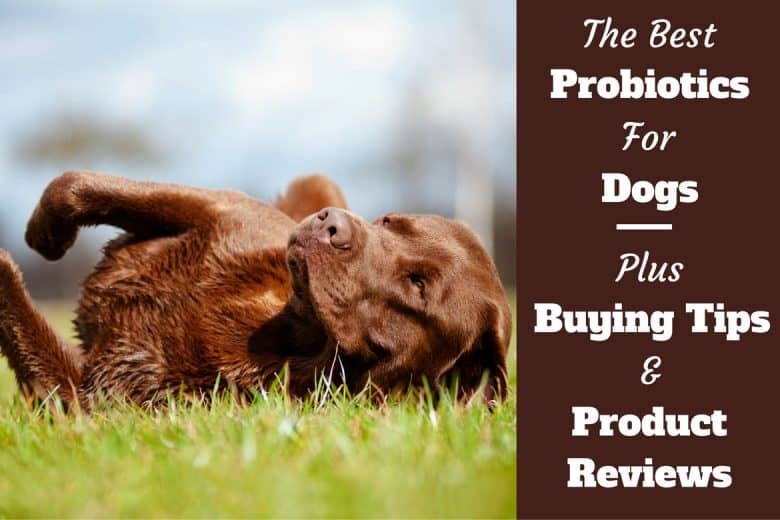 With stomach problems being a common and frequent complaint of dog owners, it’s good to know there’s a very simple solution…probiotics for dogs! Are Canine Probiotics Different to Those for Humans? Probiotics are live bacteria that help to develop and maintain a healthy environment in the stomach and digestive system. Although we normally think of bacteria as a bad thing, the kind found in probiotics help keep a lid on the bad bacteria that can cause a whole host of problems with digestion. 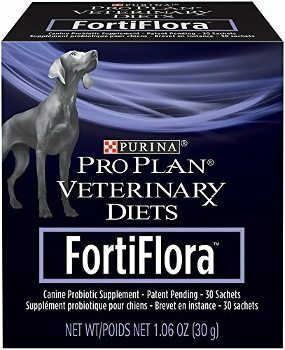 Many vets recommend giving dogs probiotics to help with a wide range of issues, including infections in the intestine such as Clostridia and Giardia, and also to help with chronic diarrhea. The live cultures that help support good digestive health are basically the same thing in both the products for humans and for dogs…but that doesn’t mean it’s a good idea to go out and get your dog some supplements that are designed for people! The main difference with the more reputable brands designed for dogs, is the manufacturers put a great deal of effort and research into making sure the bacteria survives long enough to be beneficial to the digestive system (don’t worry, we’ll go into that more later!). So realistically, it’s best to go for a product designed for your canine friend if you want to see the benefits. 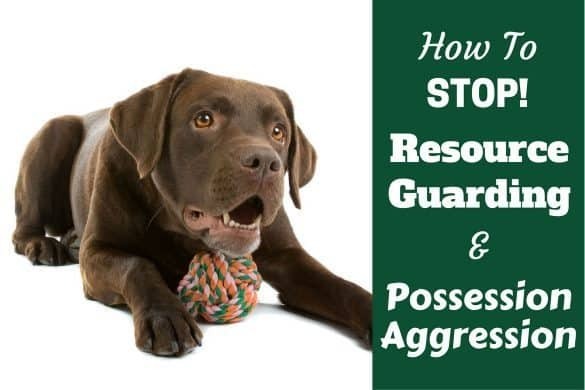 We all know that even with the best intentions of a loving owner, dogs will still manage to eat something they aren’t meant to, so having this kind of support to fight against diarrhea and food poisoning helps give that extra reassurance you’re doing everything you can to keep your pet safe and healthy. If you’re concerned your dog may have issues with their digestive health, it’s always important to see your vet to get expert medical advice. For common issues like vomiting, excessive gas and frequent diarrhea though, it’s likely a regular helping of probiotics will help solve the issues. 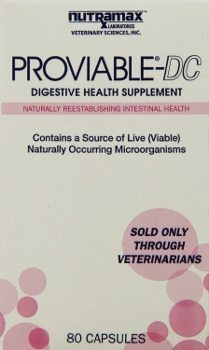 The main issue with dog probiotics (and also products designed for humans), is that sadly, most of the cheaper brands haven’t had the funding to make sure the bacteria in their product survives the harsh conditions in the stomach and make it through into the intestine…which is where they’re needed. If you opt for one of the powder products on the market, you should easily be able to see on the packaging if it contains a strain of bacteria that has been stabilized. 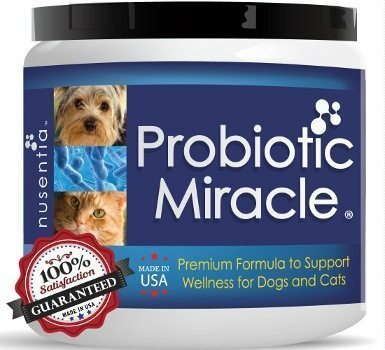 By giving your dog a probiotic in powder form, the bacteria manage to come back to life when they reach your dog’s stomach, and then can multiply and thrive as it moves into the intestines. This type of product will normally be much better than treats or dog foods that claim to contain probiotics, as sadly, the process of adding the bacteria to the other product will often actually kill it…meaning a waste of money for you, and no extra benefits for your dog. No…it’s not a typo – prebiotics are actually really great at giving the all-important probiotic the best chance of survival as it moves through the stomach. You only need to have a very small amount of prebiotic in a supplement for it to work its magic, but they really are an essential element if the live bacteria is going to make it to where it needs to go. Common prebiotics to look out for in any supplements are FOS, acacia gum or inulin. There are 2 different things to look out for here…the number of live bacteria, and the amount of different ‘species’ of bacteria found in the supplement. As far as the number of living bacteria goes, don’t let the numbers fool you – more is not better in this case. Somewhere between 3-6 billion will be plenty for maintaining basic digestive health, so don’t be tempted to pay over the odds for a product that contains more than this. The packaging of supplements should also tell you the different ‘species’ of probiotic that are included…and once again, a big number is a bad sign here! Remember that this bacteria is living, so they’ll compete with each other to work well, and get the chance to colonize and absorb. As a general rule, steer clear of any product that has more than 5 or 6 different species of probiotic, because they won’t function as well, so you’re likely to be wasting your money. As with any form of medication or supplement, there’s always a small risk of side effects. The good news is the risk of side effects caused by probiotics is extremely small, and issues are very rare. As a general rule, the benefits of giving a dog probiotics are almost always seen to significantly outweigh the possible risks (because side effects are so rare and often extremely mild). In some circumstances, giving probiotics to your dog could lead to an infection that may need prescribed antibiotics to clear it up. In more extreme cases, it’s been known for metabolic issues to develop, or for the immune system to become over–stimulated. If you’re considering giving your dog any kind of supplement, it’s always best to speak to your vet first, to make sure they’re happy that your dog is likely to respond well to the addition to their diet. To help you decide which brand would best suit your dog’s needs, we’ve rounded up our pick of the best products on the market. 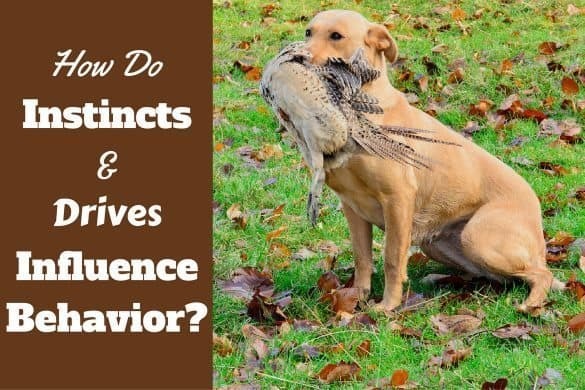 The important point to remember here is you should see an improvement in your dog if they already have digestive issues fairly quickly (around 2-3 weeks can sometimes be all if takes), because unlike humans, dogs aren’t susceptible to the placebo effect! Put simply…the supplement will either work for your dog, or it won’t! With a few different great brands available, it’s worth giving one a try, and if you feel like improvements could still be made, speak to your vet and discuss changing to a different brand to help get the most out of the probiotic supplement. This brand is very well established, and has been the favorite of vets in the USA for quite a while now. 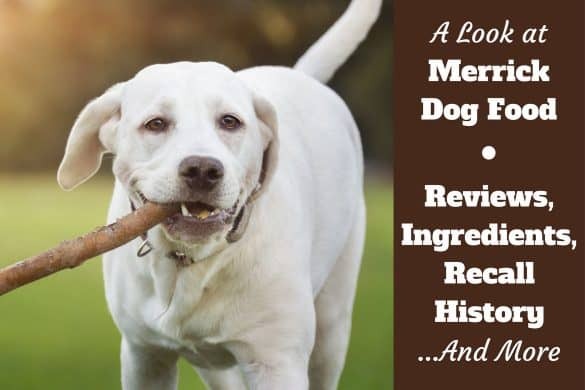 There’s been lots of research done to prove this is great not only for a dog’s digestive health, but also to help with the immune system in general. Enterococcus faecium SF68 is the prominent bacteria found in this product, but there are also a range of other beneficial ingredients including vitamins E and C.
This is a powdered product, so will need to be sprinkled onto your dog’s usual food once a day. You don’t need to worry about measuring a correct dosage, as this brand provides sachets to make it quick and easy to use – just add 1 sachet to the food and you’re done! This is a fuss-free product that has been used with great reviews for many years, and the fact it is a well trusted brand gives that extra peace of mind to let us know we’re doing everything to keep our dogs healthy. With this product being a powder, it may not stick to your dog’s meal if they have dry food. If this is what your dog is used to eating, it’s worth adding a small amount of water to the bowl first to make sure the supplement sticks to the food so all of it gets ingested.  This product offers great value for money, and rates really well with custoers who use it. With research being focused specifically on cats and dogs, the live bacteria found in this supplement have no issue reaching the intestine. As with most dry powders, this should be added to your dog’s normal food once a day to help keep them healthy and happy. This product is nice and easy to use, with a scoop provided to make sure you’re giving the right amount of supplement to your dog each day. There’s no flavor to the powder, so your dog won’t even notice they’re eating anything new with their food. Although it’s not complicated, the dosage for this product does change depending on whether your dog is healthy, ill or sensitive. Just make sure you remember to adjust the amount you give them when needed, and speak to your vet if you’re ever unsure about what the correct dose should be. This is a well-loved product by many dog owners because it offers a nice range of flexibility as far as administering it to your dog, and also offers the option to treat more severe cases of diarrhea with a short-term paste. 2 prebiotics are added to this supplement to ensure the bacteria survives through the stomach, and there are also 7 probiotics including: Bifidobacterium bifidum, Enterococcus faecium, and Enterococcus thermophiles. If your dog is currently ill and your vet is happy for you to use it, there is a short term paste version of the medication you can give to your dog for a couple of days, to help get them back on track. To give your dog a general health boost, this brand uses capsules, which you can either feed to your dog or open and sprinkle the powder into their usual food at meal times. 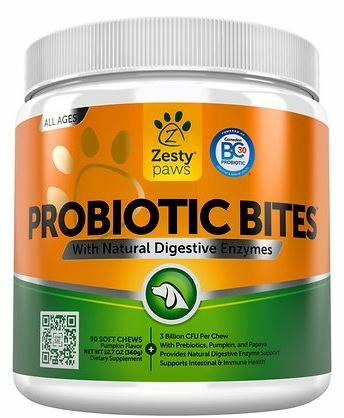 This brand offers great support for general digestive health, and also specifically for dogs who are suffering from diarrhea, so there’s no need to change brands if your dog becomes ill and needs to use the paste. The paste that is available to buy is very likely to cause constipation if used for more than a couple of days, and it’s highly recommended you speak to your vet before opting to use this more specialist supplement to treat diarrhea. 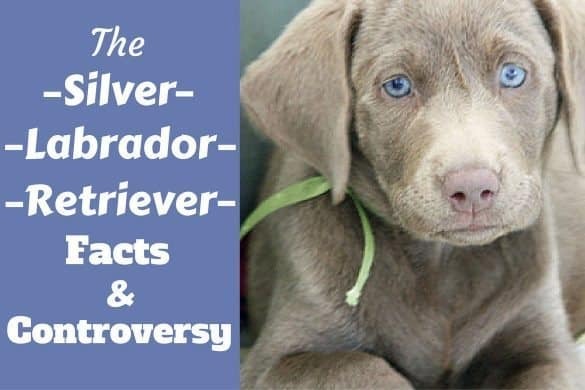 A well-trusted brand is always good news when it comes to medicine and dietary supplements, so this option has that added bonus of having a long-loved name for many dog owners. This non-dairy product is great for more sensitive dogs, who may be having issues because of dairy in products in the first place. This product contains 8 different strains of bacteria including Lactobacilus acidophilus, Bifidobacterium longum and Enterococcus thermophiles. There’s no need to worry about measuring correct doses with this product, as the supplement comes in capsules that can be opened, and the powders sprinkled onto your dog’s meal. The flavorless powder means even the fussiest of dogs would have a hard time noticing anything different! 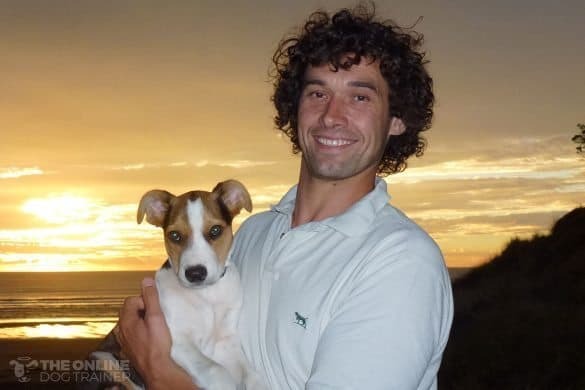 It’s guaranteed to be free of any dairy products, meaning the owners of dogs with more sensitive stomachs have one more reason to feel reassured they’re giving their dog the best chances of staying fit and healthy. 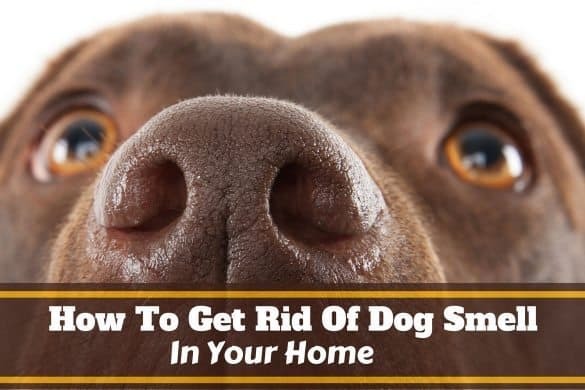 As with most probiotic supplements, heat is your enemy; remember to store this product in a cool dry place, or the bacteria will die and not be of any benefit to your dog. Offering some nice variety from our other top picks, this product comes in the form of a chewable tablet, which makes it nice and easy to administer to your dog. So if you don’t like the idea of sprinkling powder onto a meal every day, then this is the product for you! You simply give your dog 1 tablet per cup of food at every meal time to keep their digestive health on track – no need to break it up or sprinkle it, you can just give it to your dog to chew and swallow. This offers a great option if you aren’t too keen on the idea of spending longer preparing your dog’s meal every day. You can feed this to your dog by hand, or add it to their bowl to suit your preference. Unlike the powder forms, your dog will obviously notice this one, so it may not be for you if you have a very fussy eater! It’s also worth remembering this product is designed for ‘well’ dogs, so if your pet becomes ill, you may need to further supplement their diet with another product. So, is it worth giving your dog a probiotic supplement? Yes! Whether your dog is healthy, or frequently suffers from digestive issues, there will be a product out there to suit you. Remember to speak to your vet to help you decide which type of product will be best for your dog, as then you can be safe in the knowledge that adding this supplement to your dog’s diet will keep their digestive health on track! 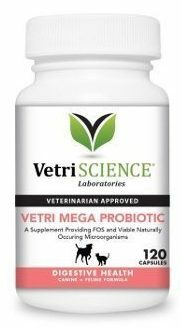 But in the description of one of your recommendations, VetriScience Vetri Mega Probiotic, says that it has eight different strains of bacteria. Is this a discrepancy or did I misinterpret something? I am also confused – if prebiotics are so great why do not all the recommended probiotics have them? Even I have the same question!!! I also don’t get and your response is not telling either.. first you say to use those that have 5 or 6 strains but your recommended ones have up to 8? In fact, most of them have more the 6. ?? ?